Up a dirt road and nestled away in nature, Hotel Pumilio is a small hotel has ten suites that fit up to five guests each. 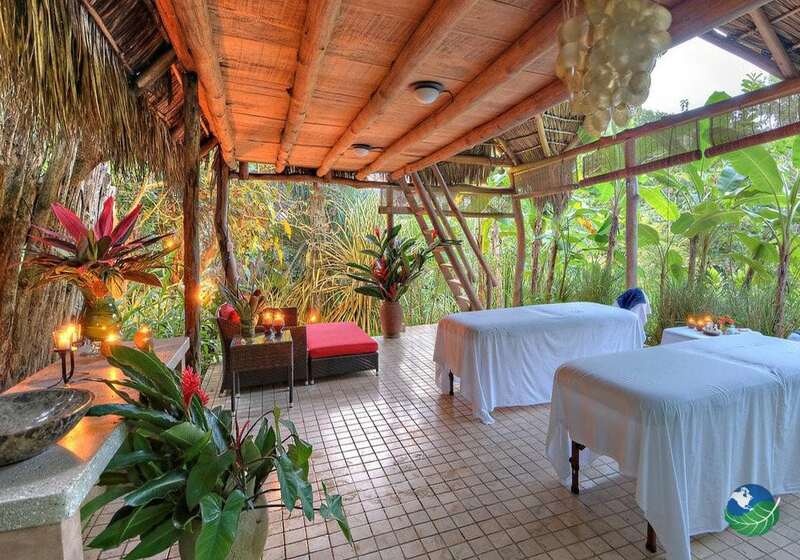 This boutique hotel near Jaco Costa Rica occupies a jungle mountain setting where scarlet macaws like to fly by. Formerly known as “El Paso de las Lapas”, Hotel Pumilio offers large rooms that are comfortable and tastefully decorated with art and nice views. 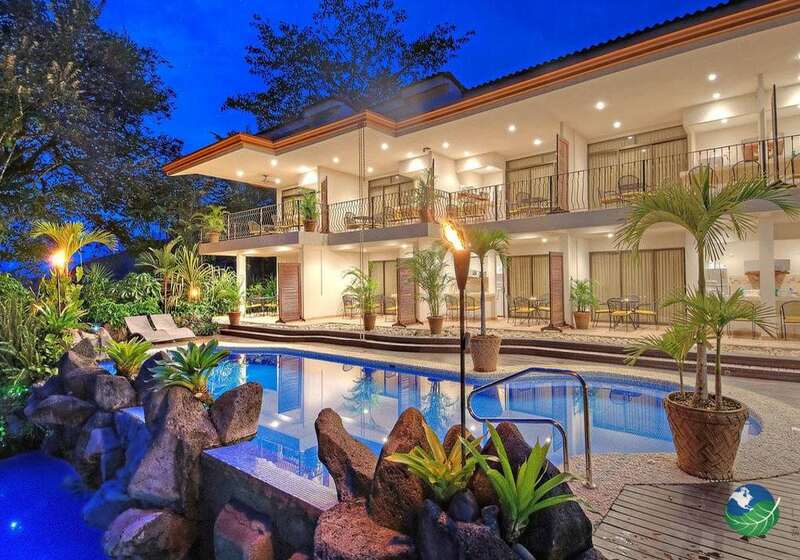 Hotel staff is incredibly helpful and friendly, they offer authentic and traditional warm Costa Rican hospitality. 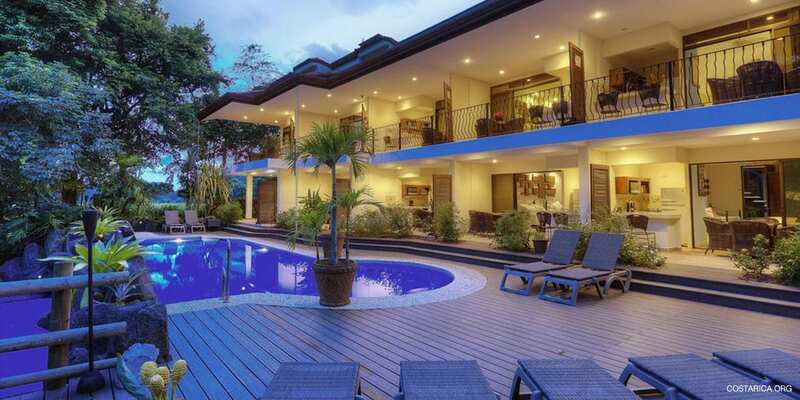 There’s a pristine waterfall that plunges into a pool that relaxes the senses for a good night’s rest. Hotel Pumilio mornings are lit up by a tropical sun where lizards, monkeys and tree frogs never fail to greet the new day. Cooking facilities for your convenience! Each suite at Hotel Pumilio comes with an outdoor kitchen equipped with a fridge, sink, stove, freezer and microwave. Kitchens also have coffee makers with coffee, cream, and sugar, pots and pans, soap, napkins and more kitchen must haves. 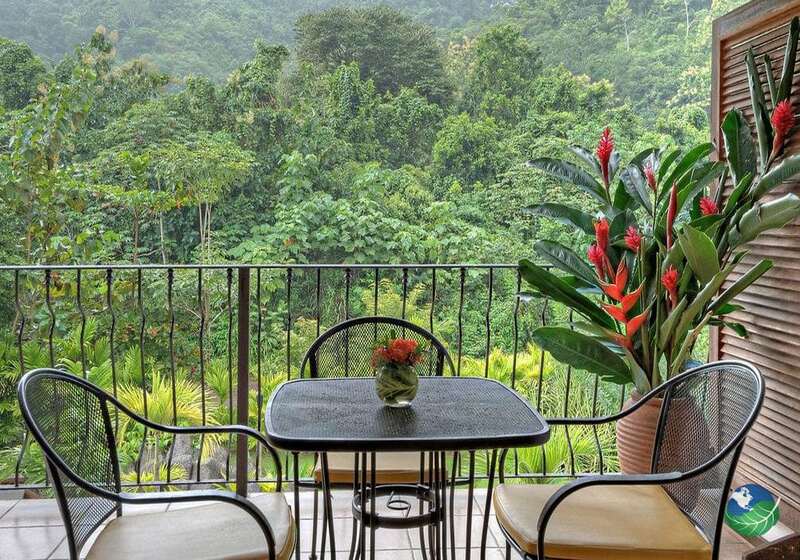 Hotel Pumilio kitchens have a balcony view towards the pool and mountains. It’s very relaxing to bird watch and drinks morning coffee at the same time. Jaco Beach is minutes from Hotel Pumilio and about an hour from San Jose, but it doesn’t seem that way. Jaco has grown in recent years and obtained the status of the city. Surfers in Costa Rica like Jaco for its dependable and generous waves all year long. There’s also plenty of night life, restaurants and activities going on in Jaco, like bungee jumping. Carara National Park nearby offers 13 thousand acres of lagoons, riparian forests, marshlands, jungles, and wildlife. Manuel Antonio National Park, where visitors are greeted on the beach by capuchin monkeys, sloths, coatis, and raccoons, is an hour’s drive. 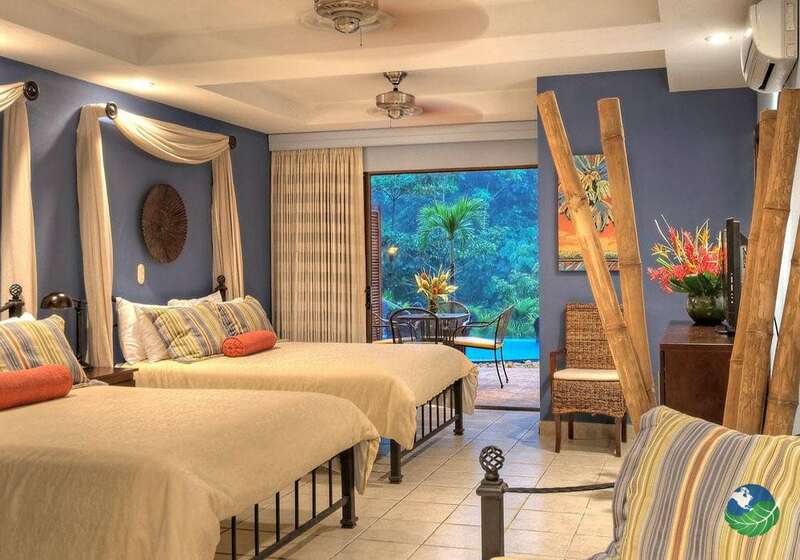 River rafting, zip lines, kayaking, aerial trams and surfing lessons are other activities available in the area for those lucky enough staying at Hotel Pumilio. 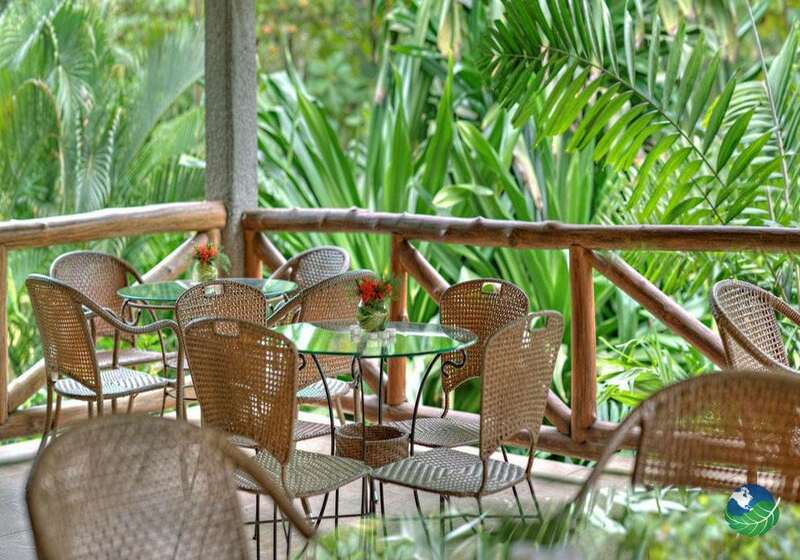 Hotel Pumilio serves fresh fruit and a delicious Costa Rican breakfast, but that’s the only meal they serve. This hotel is not within walking distance of anything; patrons without a car receive two courtesy taxi trips to town from the hotel. The WiFi connection does not work inside the rooms, balconies and public areas have a better signal. Both Manuel Antonio and Carara national parks are worth visiting, but Manuel Antonio National Park should have priority.